Canadian Northern Railway yards, 1912. Glenbow Archives, NA-1328-64369. The Canadian Northern Railway (CNoR) arrived in Edmonton in 1905 and laid tracks into downtown just north of 104th Avenue as part of its transcontinental line from Winnipeg. The company built a station at the northwest corner of 104th Avenue and 101st Street, situated right where Edmonton’s Arena District is now taking shape. The first passenger train pulled into the station on November 24th, 1905, after a journey from Winnipeg that took 27 hours and 40 minutes. It heralded the beginning of the city’s golden age of rail. As goods began arriving by boxcar after boxcar, a warehouse district sprang to life on both sides of the tracks. To accommodate all the freight that was pouring into the city, and the need to shunt and assemble trainloads, an enormous railyard was constructed north of 104th Street between 102nd Street and 121st Street. CNoR was joined by the Grand Trunk Pacific Railway (GTPR), and when the first GTPR train pulled into the downtown station at 8:15 pm on July 4th, 1910, it was a huge event, and 2,000 people cheered its arrival. Edmonton’s total population at that time was about 20,000 and so that means about 10 percent of them turned out for the momentous occasion. The train, Edmonton Express No.1, had taken just over 30 hours to travel from Winnipeg. Canadian Northern Railway station, circa 1913. City of Edmonton Archives, EA-29-130. Canadian Northern Railway booking office, 1916. Glenbow Archives, NC-6-2172. When the High Level Bridge was completed in 1913, Canadian Pacific Railway (CPR) trains began chugging into downtown. CPR constructed a new station on the north side of Jasper Avenue just west of 109th Street. It was officially opened on September 2, 1913, and the first train departed, bound for Saskatoon and Winnipeg. Built of reinforced concrete, the two-storey main structure had an immigrant waiting room, a smoking room and a women’s retiring room in its basement along with storage and offices. The main floor waiting room was finished in marble with terrazzo flooring. The worldwide depression in 1913 and the world war in 1914 severely impacted markets for passengers and the availability of cheap labour to build railways. As a result of the downturn, several Canadian railways went bankrupt, and the CNoR and GTPR were nationalized to form Canadian National Railways (CNR) in 1922. Edmonton became one of the pivotal cities on the CNR line, ensuring the continued existence of the second national Canadian railway in the lives of Edmontonians for decades to come. Between 1923 and 1928, grain shipments increased sixfold and freight traffic tripled. 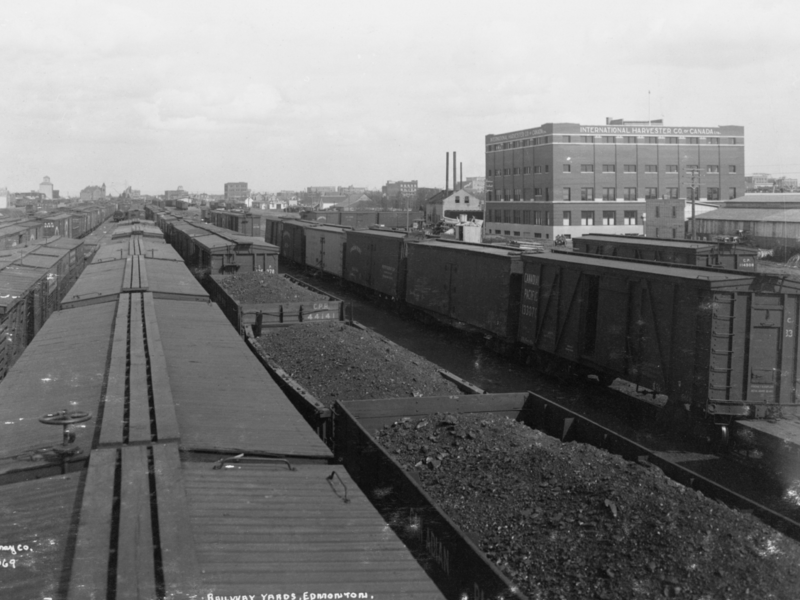 To accommodate all the new volume, the railyards were expanded to more than 20 tracks wide and, with just one level crossing at 116th Street, the City of Edmonton decided to build what it called the 109th Street Subway. The two-lane tunnel, 168 metres long and 3.3 metres wide, came to be known as the Rathole. It opened on October 19th, 1928, and was demolished in 2000. Return of the 49th Battalion, CPR station, 1919. City of Edmonton Archives, EA-659-2. Striking railway workers form a picket line outside the CNR station, August 24, 1950. City of Edmonton Archives, EA-600-4920j. CNR recognized the need for a much larger terminal and in 1927 began construction of a spacious new brick and tile station. It was oriented so that it would be exactly at the centre of the intersection of 100th Street and 104th Avenue, with a view all the way down 100th Street to the Hotel Macdonald – the railway’s other Edmonton landmark. Designed by John Schofield, the CNR’s chief architect, its main entrance was framed with heavy stone columns in the Grecian Doric style. The main building was officially opened on St. Patrick’s Day, March 17th, 1928. It measured 95 feet (29 metres) by 159 feet (48.4 metres) and, on the ground floor, contained a dining room, restaurant, a smoking room and two-storey-high main waiting room, topped with skylights. Finishes were elegant and sophisticated, including terrazzo marble on the entire ground floor and balcony, laid in two-foot squares with light and dark marble chips. Brick, supplied by Acme Brick of Edmonton, was laid atop a steel and concrete framework, and Tyndall limestone came from Manitoba. The millwork was quarter-cut oak on the ground floor and was fir on the second floor, supplied by Cushing Brothers of Edmonton. Work was overseen by general contractor Permanent Construction. A powerhouse situated 200 feet (61 metres) away produced steam to heat the building. The steam from the coal-fired boiler was transported through pipes nearly three metres high, 1.5 metres wide and buried in a tunnel three metres underground. Schofield left room for expansion, and in 1948 a third storey was added along with a bigger west wing. erior, CNR station, August 22, 1950. City of Edmonton Archives, EA-600-4920f. Looking east from 103rd Street, 1945. City of Edmonton Archives, EA-10-132. For more than 37 years, the station was a place of tears and laughter, sad goodbyes and happy reunions. It was at the station where thousands of newcomers set foot in Edmonton for the first time. Troops left for war. Some returned to the marble hall; some sadly did not. In its lifetime, Edmonton grew from 70,000 people to more than 320,000. Once the new station was operational, the 1905 Union Station on the other side of 101st Street was used for other functions related to freight shipping. It survived until 1952. The 1928 station played host to its final “All aboard!” on the evening of February 12th, 1964. Train 178 left for Saskatoon and the ticket wickets were closed for the last time. “The grand and fabulous station,” as it had been called during its grand opening, was demolished later that year to make way for the 26-storey CN Tower. The tower, Edmonton’s first skyscraper, was completed in 1966, and included a railway station in its basement. It was used until 1998, when CN moved passenger services to the mainline along Yellowhead Trail, and its closure brought an end to 93-years of passenger trains into downtown Edmonton. The railyards north of 104th Avenue were phased out of operation in 1988. By 1996 the last of the freight sheds was demolished, and the 105th Street overpass that had arced above the yards since 1960 was taken apart, too. In 1972 CPR discontinued passenger service to the north side, and six years later its historic station was demolished. CPR closed most of its downtown operations by 1984 when the South Edmonton Terminal at 39th Avenue was completed. The railway bridge over Jasper Avenue at 109th Street was dismantled in 1992 and pieces were shipped to Fort Edmonton Park. Nearly all the traces of the historic association of the railways have been erased from the heart of the city. Without the ribbons of steel and the people and goods they brought, Edmonton wouldn’t be the city it is today.